The design of this social networking website is beautiful and matches the excitement of forensics performance arts. It's fun, creative and easy to navigate. People will hardly recognize that Drupal powers the back-end as this theme is entirely custom-designed. This feature set is highly specialized in terms of the functional requirements. But with each new feature, we never sacrificed design or usability. A ton of user-generated content exists on this site; but the display is such that each page is laid out in a highly polished and clean format. The navigation and user-interface are very intuitive. The discussion forum pages are designed well and user-friendly. We even custom-designed additional key pages that are often overlooked like the registration and login pages to make them as user-friendly as possible. Organic groups was used to build out the team functionality. Ubercart was chosen to develop the premium membership subscription portal. Advanced Profile Kit was the method of choice for developing user profiles. The theme was built from scratch to match this custom design. We bring great web design to the power and flexibility of Drupal. Drupal was chosen for many reasons but primarily for the flexibility it provided in the feature development. Many features on ForCom have evolved and changed over time and we we were able to achieve deep customization using Drupal. 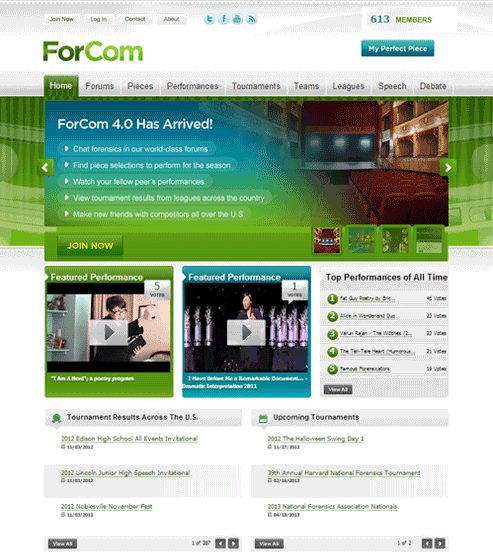 ForCom is a social network community for forensics high-school and college student competitors across the United States. It offers many tools and features for the students to engage online: discussion forms, literary piece selections, performance videos, tournament results, group team pages, league pages and hundreds of informative articles. 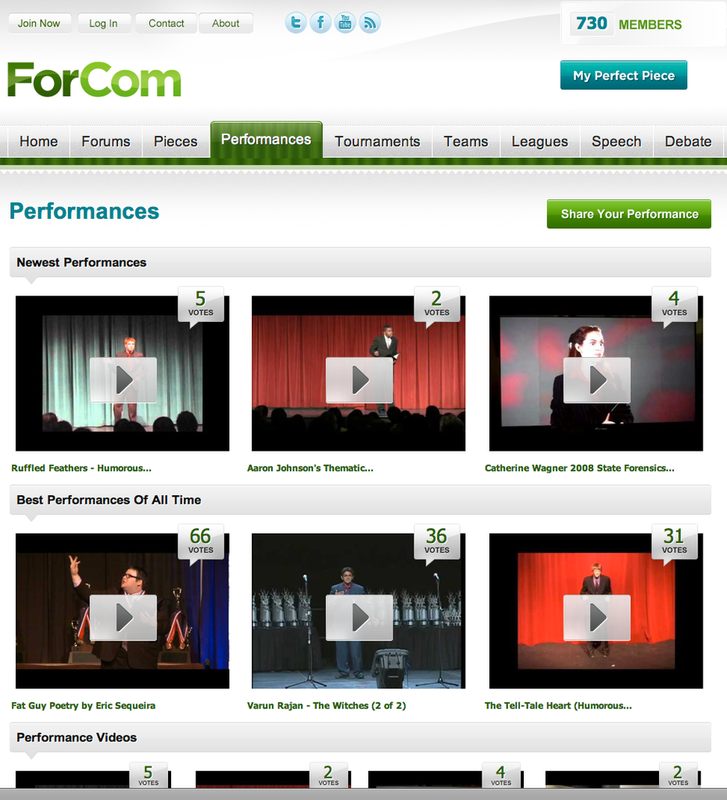 Performance videos, team pages and forums are fully user-generated. It also offers a premium subscription membership-only area of the site with select content called MyPerfectPiece. The site now has over 700 users and routinely receives over 25,000 pageviews/month, around 75% of which is organic search traffic.